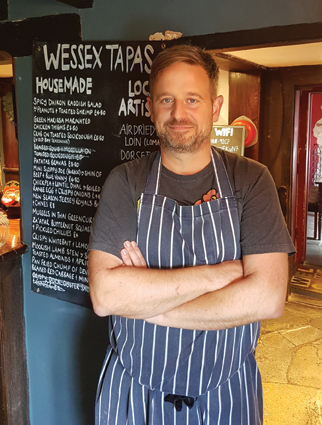 Landlord, Chef and Proprietor of the Shave Cross Inn, Joe Baron is a welcome addition to the echelon of hardworking individuals elevating Dorset’s oldest and celebrated pubs. With a menu that changes daily and a tapas selection to choose from, Joe also serves single meat choice Sunday roasts, putting all the care he can into producing a delicious locally sourced meal, incorporating a combination of cuts in the one dish. Pair this with the soulful chilled voice and guitar of BB Tim and you have a relaxed Sunday lunch difficult to beat. New to the Marshwood Vale, Joe and his wife Louise moved to Dorset last year to turn around the much-loved Shave Cross Inn. He had previously successfully established himself in Newmarket at The Thai Street Café cooking South East Asian and Thai cuisine. A frequent traveller, Joe picks up many of his cooking influences from abroad, including Spain, where he lived for a while, soaking up all the food knowledge he could. There are other strings to Joe’s bow though, as he hasn’t always been a chef. He grew up on the Isle of Anglesey, then moving to Suffolk where his parents ran a hotel. More than a music fan, he also had his own record label, producing from his music studio in Brick Lane, London. After the whirlwind winter turnaround of the pub Joe is now set for the summer. Louise, his florist trained wife is on hand to help with the running of the pub, adding her fresh touch to any jobs that need doing. Currently, she is concentrating on the garden, one of the prettiest and most quintessentially British beer gardens to be found. Together, they aim to make the Shave Cross a combination of locals’ drinking pub, food lovers’ destination and somewhere in between for everyone to celebrate the weekend in style.